The exclusive magazine for large powerboat owners, each issue is fact-packed with information on new boating equipment, advice, and filled with beautiful color photography of the latest boating destinations. Red Raider Sports Magazine offers all the inside info on the Red Raiders of Texas Tech University. Red Raider Sports Magazine includes in-depth recruiting coverage and the top stories in all the areas of Texas Tech sports. 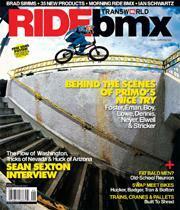 Ride BMX captures the essence of the aggressive, ever-changing freestyle and dirt jumping scenes for BMX riders. Rock & Ice magazine Offers coverage of the entire mountain scene, from rock and ice climbing to alpine ascents in the Himalaya. Also covers other outdoor adventures, such as ballooning, trekking and mountaineering. Rugby features coverage of domestic & international rugby events, decisions of U.S. & overseas rugby unions, & issues concerning club, college, high school/youth, military & women&apos;s rugby. Contains news briefs & more. Running Times consistently brings you great writing on the sport by runners for runners. It&apos;s the dedicated runner&apos;s best source for expert information on training, racing, sports medicine, inspiration, news,profiles and more.